Google Trends is my friend when I'm trying to stay on top of the lastest and greatest kitchen design trends. 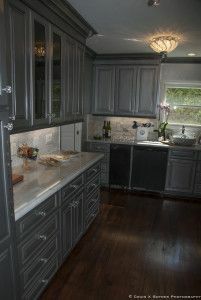 Over the last five years grey kitchen cabinets have become 1,100% more popular in California than the previous 5 years. In the last year, the interest is 50% higher than the year before (and that is not counting when it is spelled "gray"!). I can confidently say that for sure Grey Kitchen Cabinets are a top seller on the West Coast. What is the next biggest thing? 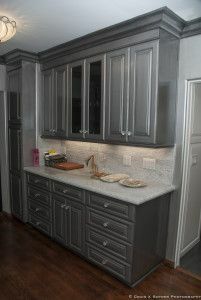 White shaker cabinets. Nobody likes to pay for a remodel and find out that from day 1 the design is outdated. Especially in Los Angeles, the newest and best design trends are desired. Here at I&E we've seen a huge surge in demand for contemporary cabinets and we can confirm the popularity of grey. Now before you sigh and throw out this idea. Take a look at Houzz's gallery. After looking through our gallery and old posts and especially after looking through Houzz, you will understand the attraction to this neutral color. Neutral isn't just shades of tan! Grey is a cool, clean and inviting color. It also goes with any decor and lets your featured design touches really stand out. Wood stain is OUT! Don't be dated, be fashionable. There is no risk either. It isn't like this is a 1970's "in" design that is considered an ugly tacky eyesore 10 years later. What is interesting is that the Grey Phenomenon applies to painted wood, for metal, melamine, and all densities of particle board. 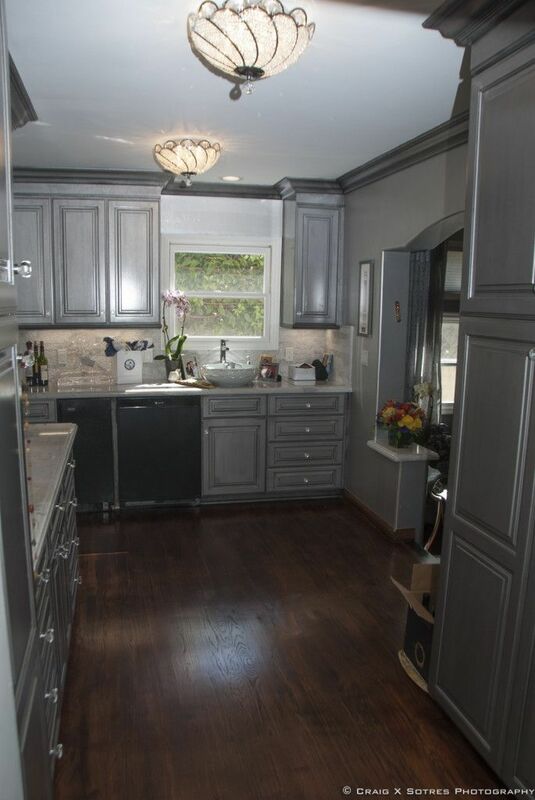 Personally I have loved both the glossy modern cabinets and the traditional wood painted cabinets in grey equally. 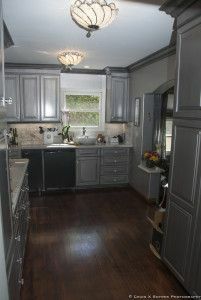 I think you should decide your Island design and then go with the cabinet material which shows it off the best.